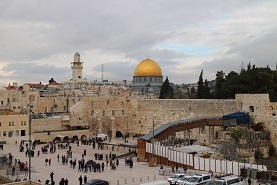 On the centenary of the Balfour Declaration, LSE PhD student Fatima Ahdash reflects on the complexities in her interfaith experience in the Holy Land and resisting the urge to take a position. On the 2nd of November this year, millions of people around the world will commemorate the centenary of the Balfour Declaration- the 67-word letter that represented Britain’s endorsement of the establishment of a “national home for Jewish people” in the Holy Land. Some, including our Prime Minister, will celebrate. Others will protest- even silently, by declining invitations to attend formal celebratory dinners. In the midst of the heated debates and the, at times feverish, accusations and counter-accusations of every imaginable ism, it can sometimes feel like one should have an opinion on the event, and should share and defend it. And here social media platforms don’t help- ‘what’s on your mind?’ they temptingly ask you- and you begin to feel the urge to take a position, to have a say. But on this occasion of the centenary, I have decided to resist the (for me usually irresistible) urge to take a definitive position and to vociferously share it. This is not to say that there are no moral rights and wrongs to the historic event itself and its perennial aftermaths. Of course there are, and people much more knowledgeable than myself have pointed them out and continue to do so. But every time I feel impelled to take a position, I remember the people I met on the LSE Faith Centre’s Interfaith Encounter trip to the Holy Land. Earlier this year, a group of LSE students, from various religious and academic backgrounds, spent our first week of 2017 in Israel and Palestine as part of an annual interfaith trip to the Holy Land. Whether it was the entrancing proximity of the holy sites and the (almost) stifling spirituality in East Jerusalem, the serenity of the Galilee or the buoyant din and buzz of Bethlehem on Orthodox Christmas day, the trip was the intense learning experience you might expect it to be. And it certainly was not the type of interfaith activity that can be dismissed for conducting easy falafel interfaith – the cliché type of interfaith event where Christians, Jews and Muslims compare their similar attitudes and teachings and wonder why their respective peoples can’t (for the love of God!) just get along. Sure enough, we met our fair share of Israeli and Palestinian peaceful hippies and co-existence activists. But they were part of a deeply complicated wider political conversation, that included settlers, refugees, politicians, ex-IDF soldiers turned radical leftists, ambassadors and ordinary Israeli and Palestinian people, challenging us with conflicting narratives of precarious peace, shaky trust, injustice and war. And so on the occasion of this centenary, I will keep this bewildering complexity at the forefront of my mind. I will remember what the people of that land, in all their differences, told us- the thoughts, fears and hopes that they so generously shared with us. I will remember that for Henry, a Holocaust survivor, Israel represented a sanctuary, a haven where he could finally live in safety and prosper. And I will remember that for Sami, a Palestinian community organiser and co-existence activist, the establishment of Israel meant uprooting and displacement. I will remember Dr Yusuf’s haunting fears for the security and future of Al-Aqsa mosque and his determination that it shall endure the physical and epistemic threats to its survival. And I will remember Yaniv’s anxieties for the future of human rights and democracy in Israel in an increasingly polarised climate. I will remember that every day the likes of Shaul, Antwan, Sami and Ophir work inconceivably hard to understand each other’s languages, each other’s fears and each other’s aspirations in the hope that one less person dies as a result of the conflict, that one day they may live in something that resembles peace. I will remember the many narratives and claims to the Land we heard from Israelis and Arabs, Jews, Muslims and Christians, the secular liberals and the religiously orthodox. I will remember that the narratives and identities we crossed throughout the trip defied categorisation and were as complicated as the history of land that they claimed a right to. But above all, I will remember what Antwan, a Palestinian peace activist told us: “we suffer from people’s ‘pro.’ Don’t be pro-Israel or pro-Palestine, be pro-solution.” I will remember this brutally honest call for restraint, for checking our privilege, this reminder that one’s words, one’s positions and stances can have a real impact on the lives of real people with real names, real families and real stories. I will remember all of this whenever I feel the urge to take a position. Fatima is a PhD Candidate in the Law Department, researching the place and role of the family in counter-terrorism. She is also a Legal Research Fellow at human rights organisation Rights Watch UK.